On Thursday 12th August 2004, Dunfermline Athletic will at long last make a return to playing European football. Not since January 1970 have The Pars kicked a ball in a competitive match against European opposition, but that is all about to change. Pars beat Everton at home! When Dunfermline fans exited East End Park on the 14th January 1970, having just seen Dunfermline beat Anderlecht 3-2 (but go out on the away goal rule) few if any could have imagined a break of 34 years before returning to Europe. Having missed out on qualification into either the then Inter Cities Fairs Cup (now the UEFA Cup) or the Cup Winners Cup only twice during the previous decade, it is safe to say that European football became an expected part of the season for a Pars player or fan. Having won the Scottish Cup in 1961, Jock Stein`s Pars became the first Fife side to take part in European competition. St Patrick`s Athletic of Dublin were the first opponents in a Cup Winner`s Cup qualifying tie in September 1961. Victories of 4-1 at home, and 4-0 away saw Dunfermline safely through their first ever European match. Another win over FK Vardar resulted in a trickier match against Upjest Dozsa in the quarter finals. 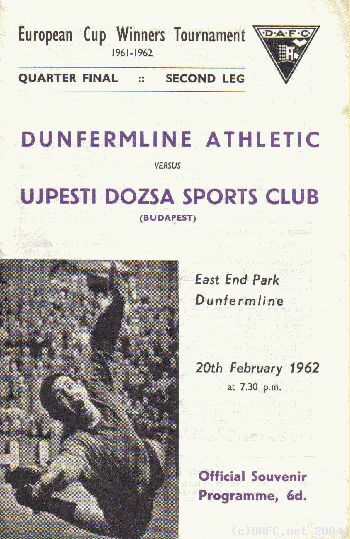 Upjest became the one (and so far only) team to beat Dunfermline at home and thus ended the first European adventure for Stein`s Pars. 1962-63 saw Dunfermline qualify for the ICFT for the first time courtesy of finishing fourth in the league during the previous season. 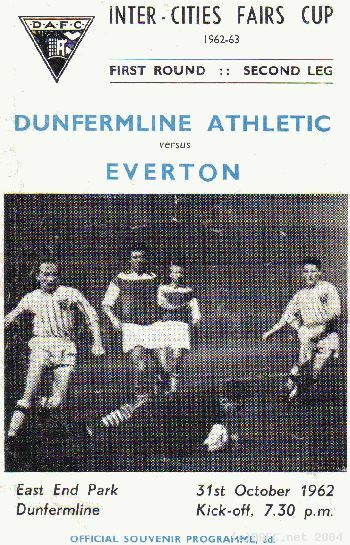 Drawn against English high flyers Everton, dubbed the Bank of England side at the time, Dunfermline were written off in the Liverpool Echo at the time. A 1-0 Everton win in the first leg at Goodison was followed by more bragging about the job being finished up here. The paper was allegedly pinned to the Dunfermline dressing room and the rest, as they saw, is history. 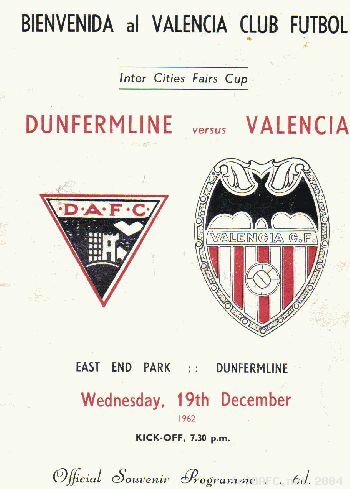 A 2-0 win at East End saw Dunfermline progress to face an even bigger giant, Valencia! A 4-0 defeat can never be seen as a good result, especially in Europe. That is what Dunfermline returned with from their first visit to Spain. A frozen, snowy pitch awaited the return leg in Dunfermline and the unthinkable happened. Nearly 15,000 fans saw The Pars win 6-2 on the night and force a replay before the days of away goals counting for more. Sadly, the neutral venue of the Stadium of Light saw a 1-0 defeat for Dunfermline. Dunfermline then missed out on Europe for a season before qualifying for the ICFT three times in a row. 1964/65 saw wins over Sweden`s Orgryte and Stuttgart, before another Spanish side, Athletico Bilbao ended Dunfermline`s interest once again. 1965/66 was similar, with wins over Denmark`s Bolkclub and Spartak Brno coming before the Spaniards again did the deed, Real Zaragoza this time! 1966/67 was the shortest European run to date, a win over FC Frigg of Oslo was followed by defeat against Dinamo Zagreb on away goals. Having missed out in 1967/68, the Scottish Cup winning Pars returned to the Cup Winner`s Cup the following season, and it proved to be the best of the lot in terms of our European pedigree. 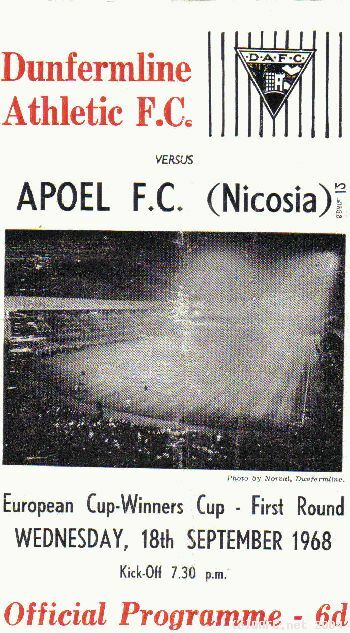 A 10-1 (that`s ten one) victory in the first leg over Apoel FC of Cyprus was the perfect start to the competition and Greek opposition followed. Olympiakos were comfortably beaten 4-0 at East End Park, but a scare followed as Dunfermline lost the away leg 3-0, thankfully the score remained at that and The Pars progressed to the quarter finals to play English opposition. FA Cup holders West Bromwich Albion were favourites to beat their Scottish opposition and held Dunfermline to a 0-0 draw in front of a huge crowd of 26,000 at East End. Pat Gardner scored an early goal to silence the Baggies and Dunfermline held on thanks in part to the heroics of goalkeeper Willie Duff who kept a clean sheet in both ties. Dunfermline had therefore reached the semi finals of the CWC and Slovan Bratislava were the opponents. An equiliser three minutes from time prevented Dunfermline taking a vital 1-0 win into the away leg, and that goal proved to be ever so crucial. Jan Capkovic followed up his goal at East End with another in Bratislava and Dunfermline went out 2-1 on aggregate to the eventual tournament winners who beat Barcelona in the final. George Farm had a second chance for European glory with the side in the following campaign. 1969/70 season saw Dunfermline given a tricky first leg draw against Bordeaux. A wonderful 4-0 win at fortress East End was thought to be enough, but a very bad tempered away leg saw the French resort to dirty tricks in order to win through. They only managed to claw back two goals however, and Dunfermline progressed to face Gwardia Waraw of Poland. A narrow 2-1 victory in the home leg was followed by an excellent 1-0 away victory. A quarter final against Anderlecht followed and we are back to where we started this look back to the past. A 1-0 away defeat countered by that 3-2 win at East End, away goals counted for Anderlecht and Dunfermline were out. Incredibly, next weeks tie against FH Hafnarfjordur will now be the next match in the sequence! A full preview of this match will be on dafc.net shortly.